We would like to say welcome home to our friend and humble humanitarian Danielle Nyquist. 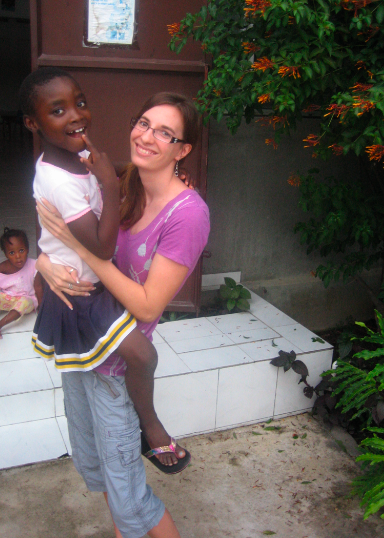 We met Danielle while serving Fondation Enfant Jesus in Haiti. Danielle was the creche’s social worker and a key correspondent for many families adopting from other countries. During this time Danielle had been a huge influence on so many children in need of love and attention. She also carried out the mission of documenting each child’s life through photos, reports and art. She wanted children who are being adopted to families outside of Haiti to have reference of their own childhood and history. We were thrilled to meet Danielle during our stay at FEJ. She was a wealth of knowledge about the community, and an incredibly intelligent woman. Now that Danielle’ position is over, she has come back to the US, and resides in Michigan. We want to not only welcome her home, but also give her a huge thank you for her compassion and generosity. The following is a heart warming entry to Danielle’s final journal of her time in Haiti (click here to view journal entry).